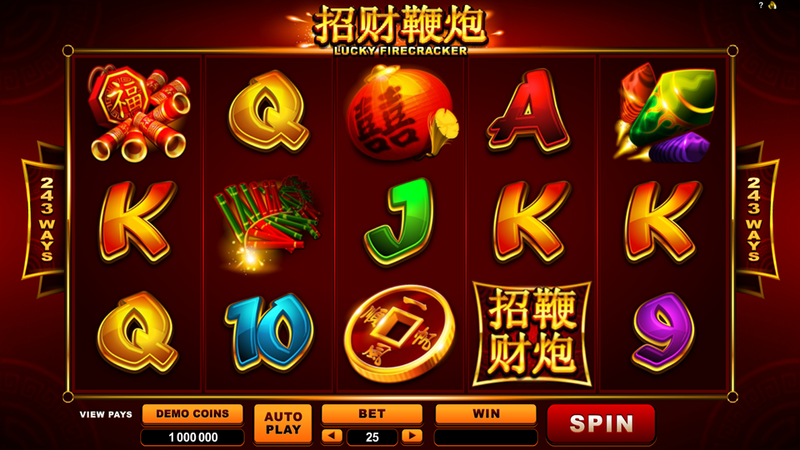 What is “Lucky Firecracker” mobile slot about? Lucky Firecracker is conceptualised and developed by Microgaming and it comes with a 5-reel (non-progressive), 3-row, 243-payline design with a maximum coin jackpot of 90,000 coins. This video slot offers you various features like that of a wild symbol, multiplier, scatter symbol and free spins. The option of a bonus game is missing in Lucky Firecrackers, but then all the other features compensate for it. The minimum bet that can be placed is €0.25 and the maximum is €250. The video slot can be played on a mobile phone running on the Android platform and also on tablets. This slot is based on the theme of Chinese new year and the whole video slot is designed to showcase the grandeur and celebrations involved in the same. You get to see firecrackers and trials of lights with symbols like lanterns, lucky coins, fireworks, and colourful explosions that bring the reels framed in ornate red and gold to life. A bold Asian theme is visible all along the game play with supporting background music and graphics. The game is compatible on iPhone and iPad making it a flexible video slot. In this game you can start the betting with eight different coin sizes namely: 0.01, 0.02, 0.05, 0.10, 0.20, 0.25, 0.50 and 1. The maximum coins you can bet is up to 250 coins. If you place a default bet of €2.50 per spin, then chances are more that you might end up with a 30,000 coin win. If the coin is worth €0.25 then the 30,000 coins become €1,200 cash with the maximum you can achieve being 90,000 coins which can amount to an even greater sum in cash. The lucky firecracker logo is the wild symbol in the game appearing on reels 2 and 4 in the base game. This symbol can substitute for any other symbol in the game other than the scatter symbol to form winning combinations. The coin symbol is the scatter symbol and if you get anywhere between 3 and 5 scatter symbols on the reels, it triggers 15 free spins with 3x multipliers and these can be re-triggered throughout the course of the game. The other symbols you would encounter while playing include paper lanterns and firecrackers. Then you have another feature called the gamble that allows you to gamble your win from any spin. Upon clicking the gamble symbol in the game a secondary window is opened which allows you to select one card from a set of cards. Guessing the correct card colour will double your staked amount and the feature ends when you guess incorrectly. Imagine firecrackers filled with coins... Ouch!